Welcome to my blog! Here we will chat about home decor, design, color, recipes, decorating tips and ideas, and all things that make a house a home. Welcome and thank you for stopping by my blog! 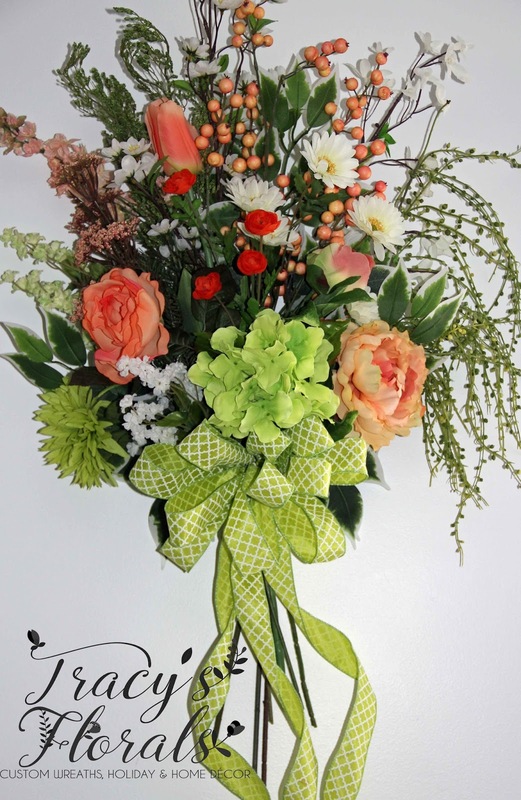 There's some exciting changes in the works for Tracy's Florals. First, I am revamping my web site, changing the look, ease of use, and adding LOTS of new items. I also have a new look for my Blog, facebook page, and Etsy shop. I'm so excited to have a beautiful, cohesive look for all aspects of my business! For that I must give credit to a wonderful designer I found after scouring the internet and Etsy. And of course it was Etsy where I found Ashley from Grace to Grow, Design and Branding Shop. She made it so fun to come up with a new logo and look for my business. Stay tuned for when all of these changes will be complete!! Secondly, I am in the midst of moving and expanding my work studio! This has been a long time coming. What began as a winter project, has turned into a Spring project! If I don't hurry its going to be my Summer project too!! :) I have to admit this has been quite an undertaking, but it will be well worth all the sweat and hard work when its all done. My studio in the past has been described by family members as "my own craft store", a "flower explosion", "craft hoarders paradise", I could go on and on, but I'm sure you get the idea! (I will do another blog post when its finished complete with 'Before' and 'After' pictures.) But the GOOD NEWS for my wonderful customers, I'll be so much more organized, be able to have more supplies on hand, and most importantly have the dedicated space to work ahead (now that's an idea!) and have more of my wreaths or florals ready and waiting to be shipped out to you more QUICKLY! That's the best part!! And lastly, I will be doing blog posts on a regular basis right here! I'll be able to let you know of any web updates, new items, upcoming events, specials or coupons, how-to's, home décor, design, and more! Be sure to sign up with your email address in the provided signup box. So for now, here's a little sneak peek of the new Tracy's Florals logo and just a FEW of the new items coming to www.tracysflorals.com ! Have a great day! 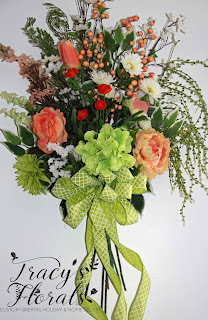 After owning my own retail store for almost 20 years, Tracy's Florals is an all new division of my business completely focusing on one of a kind floral designs all handmade by me! 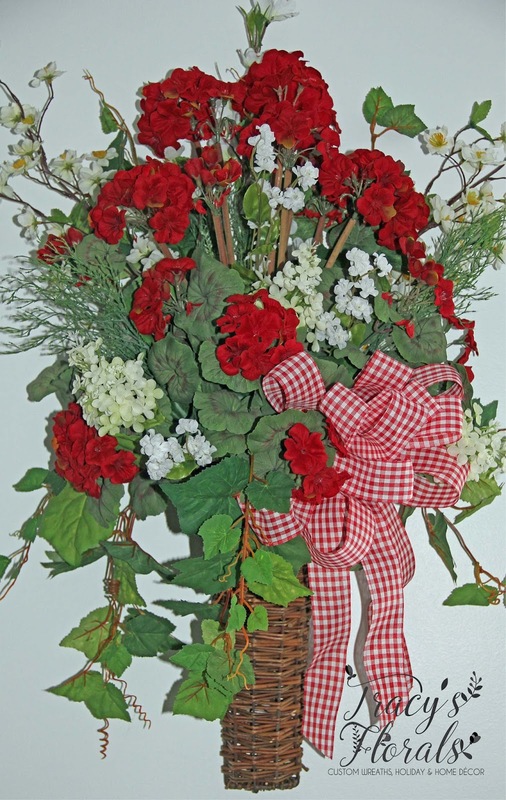 Unique wreaths, floral arrangements, swags, holiday accents, home décor, and so much more. At Tracy's Florals you will find something for all decorating styles~from Country, Victorian, Traditional, and Primitive~all in one place! Find the perfect gift, holiday decor, or the finishing touch for your home. My blog gives me the opportunity to connect with my customers on a more personal level, letting you get to know more about me, answer any questions you may have, discuss current and upcoming design trends, let you know about new items, offer home décor tips and how-to's, and so much more! !